January 27, 2019 By Eugene Nielsen & filed under All Articles, Edged Weapons, Gear. Popular Spyderco Para 3 is now available with a tough non-reflective Diamond Like Carbon (DLC) blade coating that’s bonded to the premium CPM S30V stainless steel blade. It’s practical and tactical. Looks great too. The Para 3™ is the latest generation of the Spyderco Para Military™ line of folding knives. With the Para 3, Spyderco took the time-proven features and functionality that have made the iconic Para Military™ 2—one of Spyderco’s best-selling knives—and put them into a more compact, all-purpose cutting tool that’s perfect for everyday carry. The Para 3 retains all the performance of its bigger brothers. Spyderco recently sent me one of the newest versions of the Para 3 with durable black G-10 handles, a tough matte-black Diamond Like Carbon (DLC) blade coating, and premium Crucible® CPM® S30V® particle metallurgy stainless steel blade. The Para 3 is offered in a variety of blade steels and different handle materials. The black blade models feature CPM S30V, a martensitic (hard crystalline structure) powder-made (sintered) wear- and corrosion-resistant U.S.-made high-chromium premium-grade stainless steel that also contains molybdenum and vanadium. Its chemical composition promotes the formation and even distribution of vanadium carbides, which are harder and more effective at cutting than chromium carbides. Developed by Crucible Industries specifically for knives, CPM S30V performs like a high-end tool steel with better corrosion resistance than 440C. CPM S30V has a very refined grain microstructure that allows it to take a fine, consistent edge. It has superior edge retention—better than D2 and 154CM. The performance of the steel is optimized by Spyderco’s heat treatment and cryogenic hardening process, considered among the best in the industry. The non-reflective matte-black DLC coating on the blade provides additional corrosion and abrasion resistance, improved hardness, and lubricity. DLC is a class of amorphous carbon material that exhibits the unique properties of a natural diamond: low friction and wear coefficient, high hardness, and high corrosion resistance. Leaf-shaped blade features full-flat grind, PlainEdge, and Spyderco’s patented Trademark Round Hole. The 2.95-inch blade on the Para 3 features Spyderco’s trademark leaf-shaped blade. It’s similar to a spear-point but not completely symmetrical and lacks a swedge. The blade is 0.145-inch thick at the spine and has a full-flat grind, so the flat bevels extend all the way from the spine to the cutting edge. The full-flat grind reduces drag during cutting and reduces overall weight. It provides an excellent balance of strength, point utility, and low-friction cutting performance. 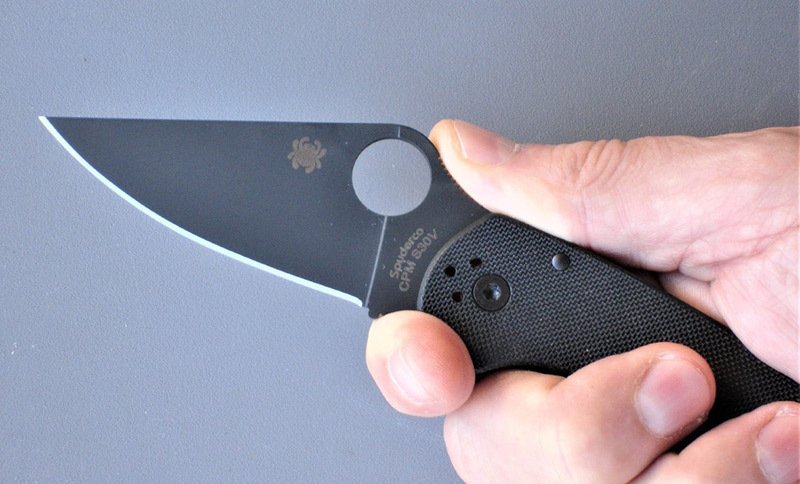 The Para 3 is available with a PlainEdge™, partially serrated CombinationEdge™ or serrated SpyderEdge™. The black blade Para 3 models are currently only available with a PlainEdge. 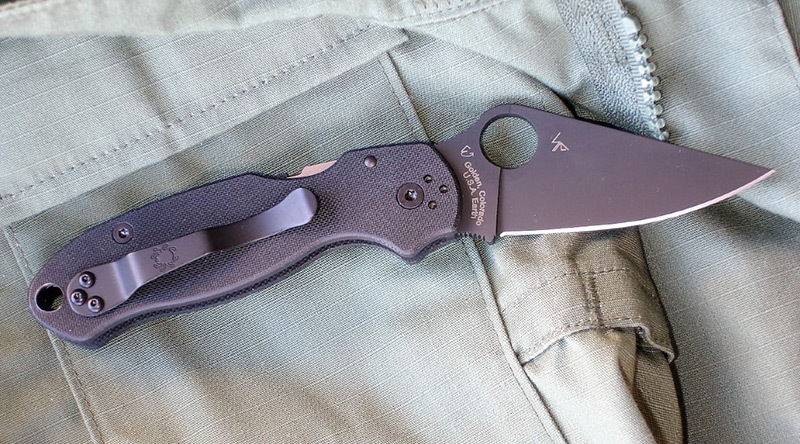 The Para 3 blade has a jimped thumb ramp and index finger choil that provide added purchase for a forward grip and added control for precise cutting tasks. The grind of the Para 3 provided to me was clean and even, as expected from Spyderco. The knife came razor sharp out of the box. The Para 3 also features Spyderco’s patented Trademark Round Hole™ for one-handed ambidextrous blade deployment. Granted a U.S. utility patent in 1981, it offers a larger surface area for greater reliability and doesn’t interfere with the cutting action of the blade. The Trademark Round Hole, along with Spyderco’s smooth bushing pivot design and phosphor bronze washers, make for swift blade deployment. Para 3 is slim and pocket friendly. Four-position clip supports left- or right-side, tip-up or tip-down carry. The Para 3 was designed to be slim and pocket friendly. It features a lightweight, open-backed construction. The G-10 scales have radiused edges for comfort. The scales have been textured to provide a secure grip without being too rough. G-10 is a tough, fiberglass-based epoxy laminate. The stainless steel liners are nestled in recesses machined into the knife’s scales to reduce handle thickness and provide support for the knife’s patented Compression Lock™. The scales are attached with stainless steel Torx® socket-head screws. The Compression Lock utilizes a leaf-like spring from a split liner in the handle to wedge laterally between the blade tang and stop pin. Think of it as an inverted liner lock. Developed by Spyderco, it first appeared in 2001 on the Spyderco Gunting, which was designed specifically for defensive tactics and close-quarters combat (CQC). It provides the extreme strength and ease of use necessary for CQC. 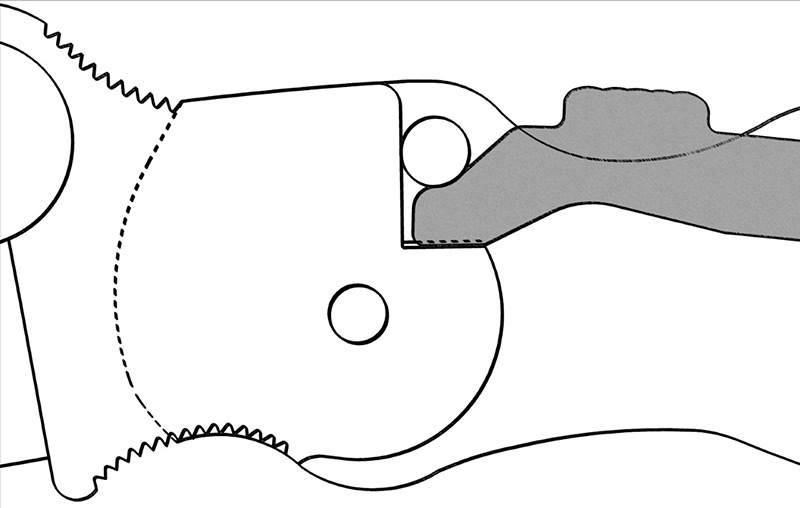 The positioning of the lock on top of the spine requires minimal hand movement to operate. Lockup is secure, with absolutely no blade play. 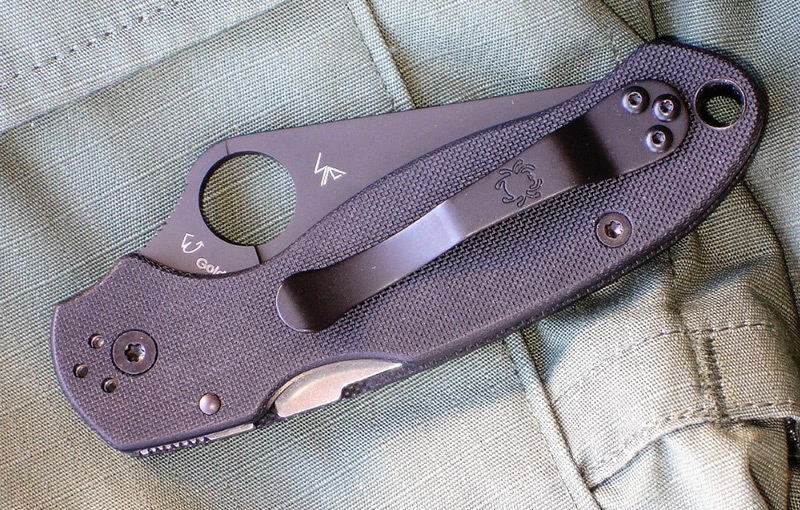 Para 3 has high-strength Compression Lock mechanism nestled within handle scales. Easy-to-clean, open-backed handle construction reduces weight. The Para 3 is equipped with a four-position stainless steel streamlined hourglass-shaped pocket clip, offering ambidextrous tip-up or tip-down carry. The pocket clip is mounted at an angle to move the bulk of the handle toward the edge of the pocket to minimize the space taken up. The pocket clip comes from the factory mounted for right-hand tip-up carry. The knife is also equipped with an oversized lanyard hole to allow for easy attachment of lanyards or fobs. Fit and finish on the Para 3 provided to me were flawless and its ergonomics excellent. Spyderco has a real winner in the U.S.-made Para 3. For those of us who have wanted a Para 3 with a black blade, the wait is over. Suggested retail price for the Spyderco Para 3 G-10 Black/Black Blade is $199.95. It’s covered by the Spyderco Limited Lifetime Warranty. Active-duty military and law enforcement personnel and qualified first responders in the U.S. may purchase Spyderco products directly from Spyderco at a substantial discount through the company’s online OpFocus™ Professional Purchase Program. 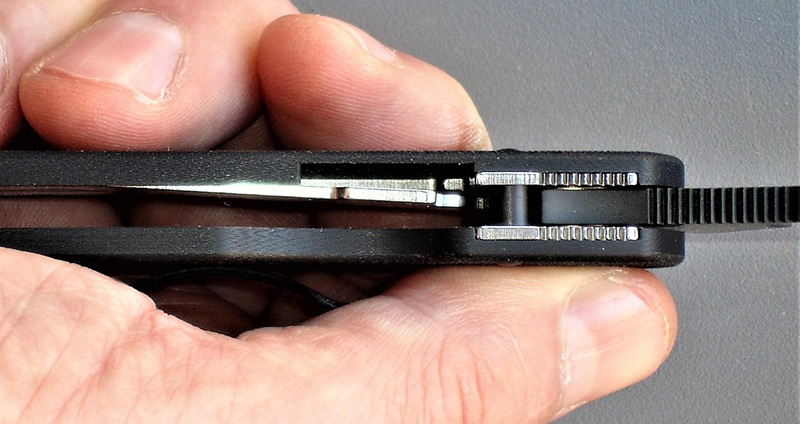 Spyderco Compression Lock. Drawing courtesy Spyderco.